Today’s subject has had some ups and downs with the Cubs. There are a lot of stretches where he is dominant and then some longer than expected stretches where he can’t get a dang out. No matter what, it is safe to say that he’s cemented his role in the major leagues as a reliever only. I can only assume that as he was coming up as a prospect that there was an assumption he would be a starting pitcher, because he has a TON of autographs and was prominently included in a lot sets relievers normally would not be in. Even as a rookie, he was a big enough name to be added everywhere, and again I have to assume that people thought he’d get a chance to start. What that really means for me is that I have dozens of signatures to chase, but the prices are pretty low for non-starter pitchers, so it’s just a matter of time. Let’s take a look at one of many I’ve already acquired. This card is one of seven C.J. 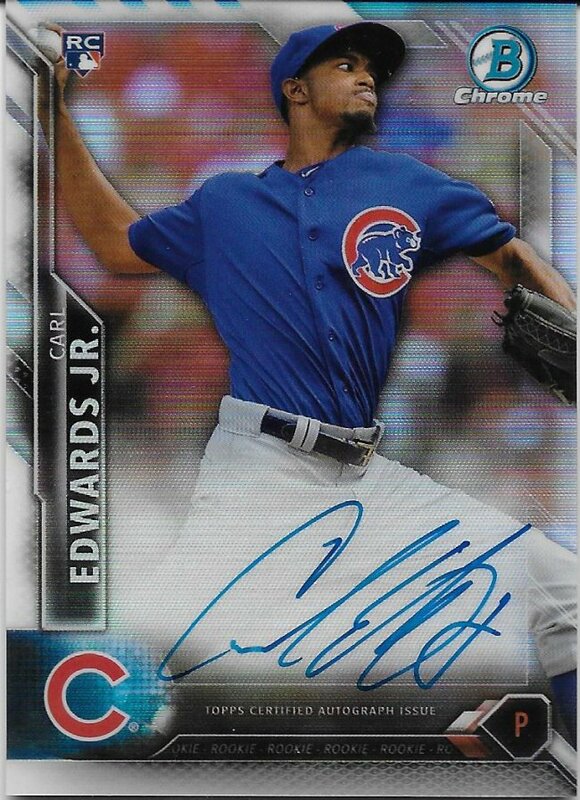 Edwards/Carl Edwards Jr. autographs I bought at the 2017 National. I’m already looking forward to the 2019 show so I can hopefully grab another handful or two. There is little to score here in his favor. This is a crazy big scribble with little form or grace. He makes the most of his signing area and stretches those letters. That’s pretty cool at least. Top to bottom and left to right, space is all utilized. I’m going to say yes and no for this part. It’s not lazy because he seems to be writing just about every letter of a reasonably sized name, including the J at the end. It is a little lazy because it’s sloppy and the signatures across different cards is not all that consistent. This example is actually one of the most jagged signatures I have. Most have cleaner loops or flow. Maybe this card was near the end of a longer session. The dude did sign a lot of cards and stickers for 2016 sets, after all. 2016 and before, there are a mountain of autographs still to chase. 2017, there is one. 2018, a couple more in Panini products. I think the worst is over in terms of signature overload. Unless he does get that chance to be a starter and finds success in that role, or if he gets to be a dominant closer, I think my auto collecting journey should be a fun and easy walk on level ground.